Brandon University Student Leaders were celebrated at a special dinner that capped their program. 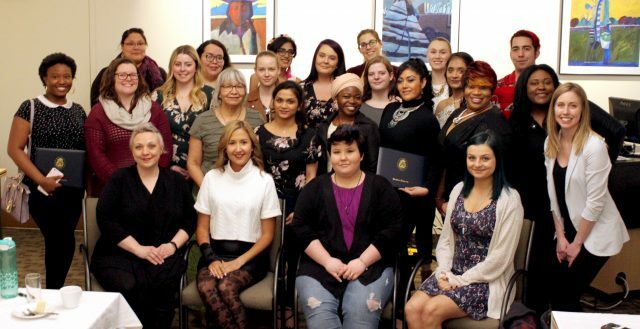 Brandon University (BU) has honoured 25 students for their commitment to leadership. Their efforts were recognized at a celebration dinner on Wednesday that capped the 2017–18 Student Leader Certificate Program. The students attended a series of eight free workshops throughout the academic year, each on a different topic related to leadership. Reconciliation was a theme of this year’s program, with Indigenous perspectives and teaching woven into the subject matter of each workshop. Elder Barb Blind offered leadership and guidance throughout the program. Tasha Spillett was the keynote speaker, while Leonard Sumner provided entertainment for the event. Spillett is an educator and poet. Sumner is an Anishinaabe singer/songwriter and MC, who released his newest album, Standing in the Light, earlier this week. Sumner and Spillett also gave a free public performance earlier in the day at the Lorne Watson Recital Hall as part of Indigenous Awareness Week at BU.